I am actually pre-shooting these for my upcoming NYC trip. I plan on wearing these looks while I'm in the Big Apple. When you have a fancy camera it can be hard to find someone who can take a clear shot. Anyways, wondering how to bring your crop tops into fall or how to just participate in the trend? I got you. Fall colored crop tops are a sure fire way to make sure your vertically challenged shirt is season appropriate. Dinner Party: Sometimes crop tops get a bad name. They are seen as anything, but elegant or lady like. Pairing it with a high-waist flare skirt or pencil can keep it lady-like. This is also the perfect high-low pair. Low end top + plus high end skirt = expensive look. Street Style: These are actually harem pants from Forever21. Inexpensive harem pants can give girls with the big booties enough room for that high-waisted look. This look is ultra comfortable but put together. Now, I am not just going to walk around NYC with my booty just out for the taking. I don't have that kind of time nor do I want to be bothered by any of my male counterparts. Those NYC dudes are kind of aggressive. LOL. I added in this sweater around my waist to add a little bit of coverage or if I get cold. Playing it Safe: I think this is perfect for those that like the cropped look, but just feel that they just can't let their mid-section out. A crop can easily be added to a tank or body con dress. It will give you full coverage on the tummy area, but will allow you to get in on the crop action. Style Note: This crop is from the reg. sizes of ASOS. 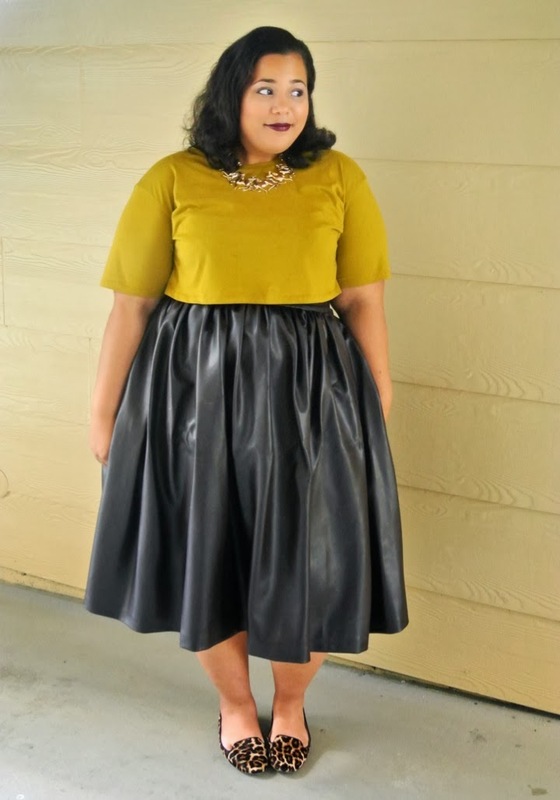 The top is described as having a wide sleeve which make is perfect for plus size arms. Also fyi, Milani lipsticks are really beautifully pigmented. I was telling my sister if times ever got hard remember that their colors are great. They usually run $4 - $5. Shapewear courtesy of HookedUp Shapewear. LOVE all the looks but, the street style look is my fave! Possibly b/c of the leopard pants, lol. Fabulous! I love it! Especially the leopard pants. I've been looking at them for a couple weeks now. Love the looks. Quick question.... How do you like the fit of the pants? Can I just say I'm devastated. I want that top so badly, but I am on a shopping freeze and it can't happen right now. As for the looks, they are all amazing. Scrolling through facebook, it stopped me in my tracks. ALL OF THESE LOOKS ARE THE BOMB CHASITY!!! 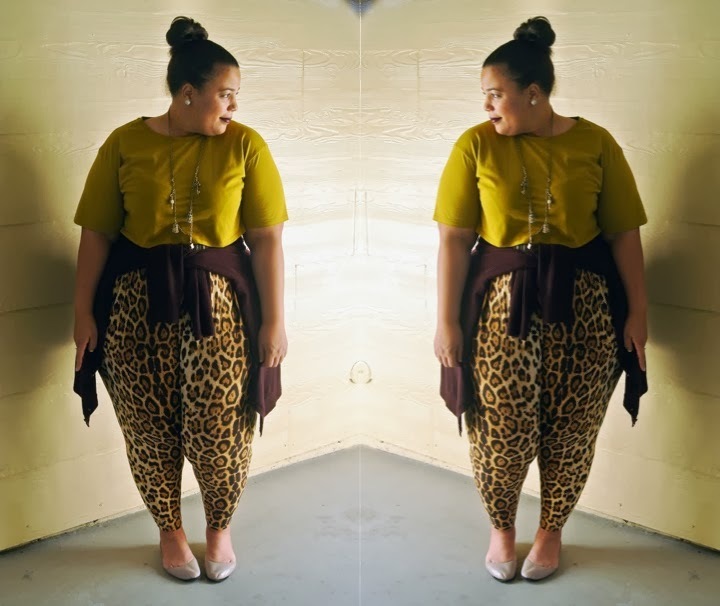 I am so glad you have on the harem pants from Forever 21 I was so unsure of how the fit would be. YOU GO BOO!!! loveeeeeee all three looks ! I adore how your pencil shirt fits you perfectly!!!! I want to buy this shirt now!!! So much inspiration! Love all three, but my fave is the crop and dress. Now I know how to wear a crop and will finally buy one. Your style is awesome!!! You look fabulous as usual!!! I just got these pants in the mail and I soo don't want to take them off! Now I need to find this gloss! Wow!! I adore all three looks! You did your thing with this! Beautiful color for the top! Lately forever21's pants have not been fitting me, giving me the impression they were more of a junior plus line. But now I am interested. I love your style. Please note it is very cold in NYC now! Burr ware! 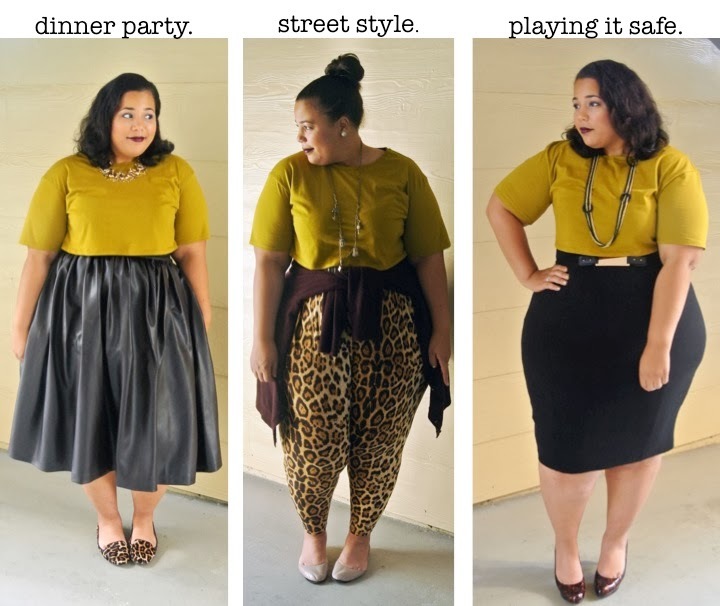 I love that you showed three different ways to sport a crop top. It's great for women like me who aren't so sure about them to see how they work styled a variety of ways. It definitely makes them less intimidating. I'm also really loving this high-waisted harem pant trend. They seem so chic but also really comfy, and they create a silhouette that I really like. The outfit with pencil skirt is the one I like the most. You look beautiful. Hi Chas - I want to order that Asos dress but i find that some of their stuff runs big. Is this dress true to size in your opinion? The Jennifer Lopez pants run large. I have to reorder in a smaller size. I'm roughly a 2x and they were way too big. Just an FYI. When you are content with your choice simply press enter, or click on the tick mark on the toolbar, or double tap the mouse inside the crop casing to finish the crop.